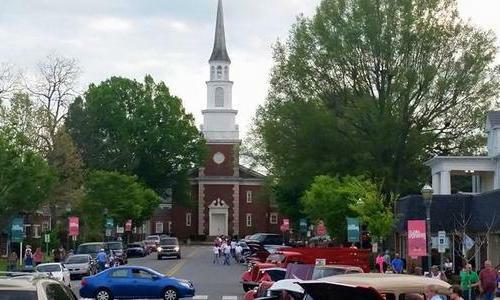 At First Baptist, we like to say that "every member is a minister." We want to encourage and equip all those in our fellowship to live out their calling as a beloved child of God in all the various ways they are gifted. 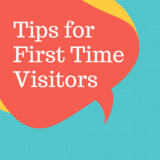 We want all guests to feel like they are at home when on campus, and this is the best place to find some key information you may need as a first time visitor. On Sunday mornings you will find greeters at our portico and sanctuary entrances, so don't hesitate to ask any questions you may have while on campus. We look forward to getting to know you when we see you next! Where should I enter? 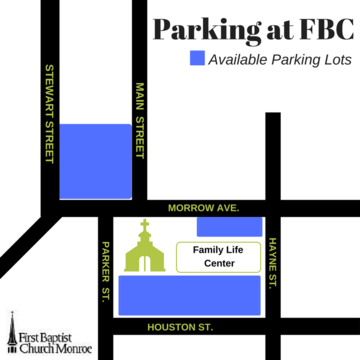 : There are two main entry points to FBC; 1) our portico entry which is located at the rear of the building accessible via the parking lot on Houston St., and 2) the sanctuary doors accessible from the Morrow St/Main St. side. If you arrive in time for Bible Fellowship, we suggest using the portico entrance. If arriving after 10 AM, the doors you will need to use are the sanctuary doors located on Morrow Ave.
Is the church handicap accessible? : The parking lot at the rear (accessed via Houston St.) has designated handicap spots. Both entries are handicap accessible. The portico entrance offers the quickest access to our facility's elevator which provides transport to all three levels of our campus. What should I wear when I visit? : There is no expected dress for any of our gatherings. During our worship service, you will find a wide variety of attire. Most folks are comfortable in suits or dresses; many are comfortable in more casual wear. Know that you will not be singled out no matter what you choose to wear. Attire on Wednesday nights and at other church functions is more relaxed. What style of worship should I expect? Our Sunday morning worship service is intentionally planned by our ministerial staff to create an atmosphere where contemplation and praise are possible. Our service would typically be described as "traditional" but we work to incorporate a variety of elements. At First Baptist, we follow the church year and the common lectionary, which provides a natural rhythm for the seasons of our life together. We are helped in this regard by our talented choir and musicians who provide a meaningful music experience. You will find that our service is not based on entertainment, but on a desire to open minds and to feed hearts. What are my options for my children/Is there a nursery? : At First Baptist, we see all ages as vibrant contributors to our faith community, therefore we enthusiastically welcome and encourage children to attend worship with their families. However, we know that parents like to have choices, or maybe even a break from your responsibilities when attending worship, so we offer different age-appropriate options for your child. For newborns - age 4, we offer a nursery managed by caring adults from our congregation. The nursery is located in the Family Life Center and can be accessed through the courtyard door on the Morrow Ave. side of the church. For children age 4 - 2nd grade, we offer an age-based worship experience called Children's Worship & Wonder. Children attending W&W depart from the sanctuary at a designated time which you can find printed in each worship's bulletin. For more info on W&W click here.